Enjoy our top Malibu cocktail recipes and WIN a bottle for yourself! Sass up your cocktails with these Malibu drinks recipes and WIN a bottle for yourself! The coconutty deliciousness which is Malibu has long been a firm favourite for its deliciously sweet and tropical taste, reminiscent of sunny holidays, palm trees and white sands. We’ve put together five of our favourite Malibu cocktail recipes for you to enjoy. 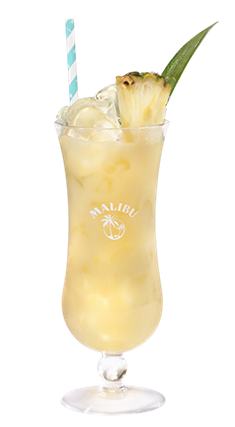 And don’t forget to try the new Malibu Pineapple too! Add ice cubes to a chilled glass. Add Malibu, cranberry juice and pineapple. Garnish with a lime wheel. Fill a shaker with ice cubes. Add Malibu, coconut cream and pineapple juice. Shake and strain into a chilled highball glass filled with ice cubes. Top up with pineapple juice and garnish with fresh pineapple. Add Malibu to a highball glass. Add warm apple juice. Garnish with cinnamon stick and apple wedge. Add Malibu, orange juice, lemon juice, simple syrup, and egg white to a shaker. Shake and strain into chilled rocks glass filled with ice. Garnish with Angostura bitters and orange twist. Add ice cubes to a chilled highball glass. Add Malibu Pineapple and top up with Coconut Water. Garnish with a squeezed lime wedge. Entrants must be ages 18 or over. By entering the competition you agree to be added to our monthly newsletter. We may pass your details to Malibu.co.uk please email us at info@seeninthecity.co.uk if you would like to opt out of this.